ISHPEMING, Mich. – Last month, Carl Pellonpaa marked the end of an era in television history with two words: “siinä kaikki”—that’s it. After 53 years and more than 2,650 straight weekly episodes of hosting “Finland Calling,” Mr. Pellonpaa will cap a career that far outpaces David Letterman, Johnny Carson and “Saturday Night Live.” Some might say he is Finnished. Mr. Pellonpaa isn’t some yokel with a program on public-access. In the sprawling tundra of Michigan’s Upper Peninsula, his Sunday morning show about music, history, politics, travel and anything else Finnish has built the one-time weatherman into a legend, stirring debate over whether he can be replaced. Known as a land of “Yoopers” – often stereotyped as talking with a Scandinavian brogue and living on baked meat pies – Michigan’s U.P. is packed with ethnic Finns. And Mr. Pellonpaa is the link to their homeland, also hosting Finnish dance parties and leading dozens of trips to Finland (but not before pre-taping episodes to be aired in his absence). In Marquette, the U.P.’s biggest city, Mr. Pellonpaa posts better Nielsen ratings than “Fox News Sunday” and NBC’s “Meet the Press.” “Finland Calling” is as ingrained in the Sunday routine as attending church or watching professional football. Over the years, guests included two presidents and a prime minister of Finland, as well as entertainers, choirs, teachers and students. “It’s always been understood that if anyone has a relative visiting from Finland they are to call me and set up a show date,” Mr. Pellonpaa says. In addition, the show featured clips of Finnish folk groups, polkas, waltzes, tangos and schottisches. At 84, Mr. Pellonpaa says he is feeling his age and needs to focus on what matters most. His wife, Doris, has helped keep the TV star’s head on straight for decades, but now has sore knees and shoulders. The couple have been married 61 years. “I’d like to be able to hang tight with her now,” he says. Fifteen years ago, when he fell into the habit of broadcasting his show with an open collar, Mrs. Pellonpaa said he looked like a “dumb Finn” and needed to wear a tie. After Mr. Pellonpaa’s heart surgery, she pinched his cheeks so he wouldn’t look so pale on television. But Mr. Parker said unique content is hard to find. “To lose a program like ‘Finland Calling’ will be a huge gap in that local service,” he said. “It’s so local and ingrained in the market.” He declined to comment on the station’s future plans. In his tenure as host, Mr. Pellonpaa has had cancer, open-heart surgery and two new hips. He also never missed an episode. Some say he missed a show in the 1960s. He dismisses this. “The kids gave me the mumps,” Mr. Pellonpaa says. He says he did the show live on the telephone from the confines of his bedroom. These days, Mr. Pellonpaa – wearing his signature powder-blue sport coat – has been taping his program on Wednesdays with a one-man crew on mics and cameras. Once a purely Finnish-language show, it now repeats much of the content in English. Last Sunday, Mr. Pellonpaa took a break from setting up the final “Finland Calling” dance at the Elks Lodge to grab a sprinkled doughnut. Between sips of black coffee, he calls to his granddaughter and suggests using a marker to alter a poster congratulating him on 52 years in the business. Thirty minutes later, he shuffles across the floor with the assistance of a cane and settles in below blue and white Christmas lights (Finland’s colors) to watch his show, something he rarely does because it conflicts with church. Mrs. Pellonpaa introduces the show, taped a few days earlier, as the official 53rd anniversary telecast, and her recollections are interspersed among Finnish music and footage from old dances. A couple of hours later, hundreds of Yoopers, many casting aside their walkers and canes, dance around him. “They say celebrity — no, I just do a job,” he says. Still, Mr. Pellonpaa is proud. A diminutive songbird weighing the equivalent of just three teaspoons of sugar can fly over the north Atlantic, scientists have said, resolving a 50-year mystery. 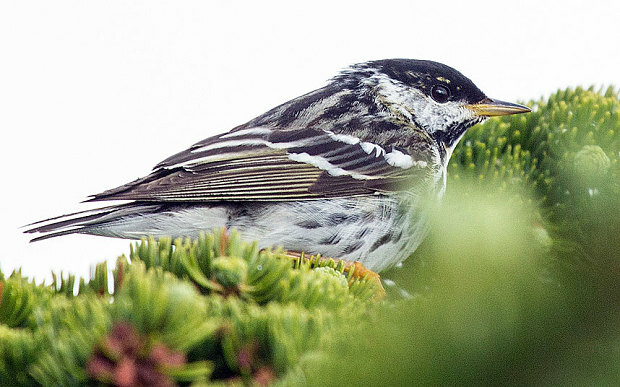 Tipping the scale at a mere 4.2 ounces, the white-throated, black-capped blackpoll warbler (Setophaga striata) migrates each autumn from New England to South America. For half a century, scientists have debated whether the birds fly non-stop over the ocean or take breaks on land to carry out this marathon flight. Backpack flight recorders, attached to 40 of the birds, have now provided “irrefutable evidence” that they do it all in one go, the scientists reported in the journal Biology Letters. The geolocators, weighing only 0.02 ounces, found that the birds completed an astonishing non-stop flight of between 1,410-1,721 miles. This was the distance from their summer homes in Vermont and Nova Scotia to Puerto Rico, Cuba and the Greater Antilles islands, where they made landfall before continuing to northern Venezuela and Colombia. The devices were able to track the birds’ flight path but were not big enough to transmit the data in real time. Three devices with the stored information were recovered for analysis from the Vermont birds, and two from the Novia Scotia group. 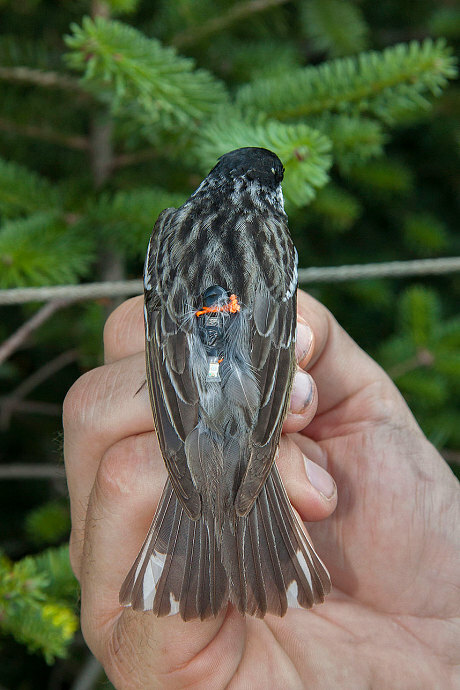 A blackpoll warbler fitted with a miniaturized light-sensing geolocator. Albatrosses, sandpipers and gulls are famous for their ultra-long flights – but they have broad, long wings and can settle on water if they get tired or blown off course. For a forest bird no bigger than a tennis ball, which would drown if it touched the sea, to do such a feat is a wonder, the researchers said. “For small songbirds, we are only just now beginning to understand the migratory routes that connect temperate breeding grounds to tropical wintering areas,” said Bill DeLuca at the University of Massachusetts Amherst. The trackers provided confirmation that had thwarted previous investigations into the blackpolls. “The indirect evidence in favor of an Atlantic voyage was fairly strong,” said Ryan Norris, a professor of biology at the University of Guelph, Ontario. From The Wall Street Journal and London’s Daily Telegraph.